Can anyone tell me what a reasonable life span for a set of glow plugs should be? I put new ones in my VW 2 winters ago and now they seem to be giving up on me. I thought they should last longer than 2 years. 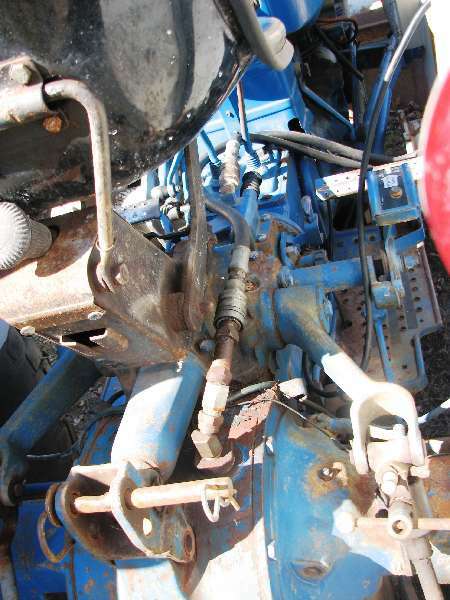 Before I disassemble all the injector lines to get to them out, is there something I can do to clean them - fuel addative wise? I can still get the car to start in the sub-zero weather but it has become quite difficult now. Any thoughts? The easiest way to check glow plugs is to remove the wiring and test each to ground with an ohmmeter. I can't say what the reading for yours should be but my Ford manual calls for 1 ohm. Either high or low readings indicate a bad plug. As far as I know plugs are either good or bad and they also are pretty much self-cleaning so additives wouldn't help. However, the ohm reading would be low if they were carboned, which would be unlikely unless the tractor had been smoking a lot. My plugs have been working for 25-years (700 hours). I think of them as bomb proof but Art says that maybe I shouldn't expect such long life. A recent discussion was about some bad ones that were only several years old so maybe. I'd take ohm readings and also the battery condition before doing anything else. I don't know if one shot on these automatically timed plugs on new tractors is good enough in very cold weather. About that comes to my mind is if you aren't already; install an engine block heater to minimize glow plug cycle times. Glow plugs should last much longer than you are experiencing. Have you done a resistance check as Tom said? Battery is 3 weeks old. Unfortunately can't plug in at work, but do at home. Starts right up then! Once I finish up in the shop (drywalling) I'll pull the VW in and disassemble again to see what I've got. It's just a big PITA to pull the injector lines, injectors and all the other BS out from around the 'plugs just to get to them! Are you sure is it the glow plugs? Could be a relay or timer module? Any blown fuses or fusible links? I am not up on VW's so I am just putting some thoughts out there to consider. Just gonna have to tear it all apart. I thought maybe someone might have a "good 'ol boy" way of doing something. I'm pretty sure my Ford starts easier when it's running close to straight #1 fuel. Maybe something like that would be enough to get you by at work--especially if it's a daytime job. I've never used WD-40 as a starting aid. I'm not sure if it's entirely safe for an engine but it's supposed to help starting. My approach to winter mechanics is doing anything that's not going to cause damage that'll get me by till warmer weather. Man do I hate grabbing those wrenches that sting your hands and trying to start bolts with numb fingers. My experience with glow plugs is that they're like light bulbs, either they work or they're burnt out, period. I've never heard of carbon fouling a glow plug to the point of non-function. The principle by which they work is merely to provide a hot spot to aid detonation, it doesn't matter to the fuel if it's steel or carbon thats hot. Something does sound fishy alright, ther is only one thing that can kill glow plugs that fast, either cold fuel or starter fluid is getting to them while they're still too hot, or your relay is sticking and causing them to heat while the engine is running. You might also want to investigate your parts source from 2 years ago, did you get sub-standard glow plugs. Otherwise they should last MANY years. Fo ow-up: 1 of the 4 glow plugs was dead. Going to replace it and rewire with 10g wire rather than a stamped "buss bar". More amps gotta be better than less when it comes to glo plugs!